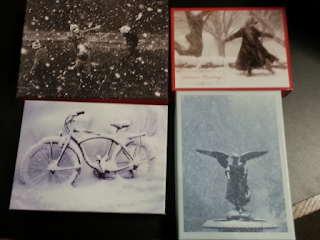 My Favorite Christmas and Holiday Cards (Loose Edition). One of the things I mentioned about holiday cards is that you have to be a little more conservative when buying boxed cards. It's in the loose cards that you can go a little crazy. Not only are they willing to go a little quirkier on one card, they'll pay more for one too. This is from a card line we get from the Pacific Northwest. The artist is Nicholas John Frith. It reminds me a bit of the Hello Luck designs. There's also an old Hanna Barbara feel about them, isn't there? This is from a Canadian distributor. The artist, Graham Dale, mimics famous artistic works, substituting in snowmen. Another snowman image. These are from two different lines. The artist on the left is Deme (?) Schlehofer. I may have miscopied that! The artist on the right is Frank Viva, famous for his New Yorker covers and children's books. I've mentioned in the past how much I love Ghost Academy cards. What I didn't notice before is how secretive they are about their names. It's a husband and wife, but they don't identify themselves in their website, blog, or Facebook page, and they even own a second business, a floral studio. From an interview on the Ecka and Peck page (that's another card line), it appeared to me that Megan is the artist of the two. 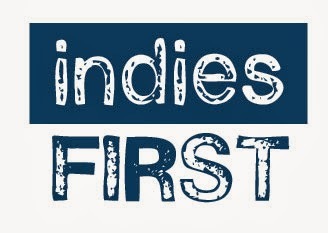 More About Our Indies First Author/Booksellers--What Exactly are They Recommending? While Black Friday has morphed into simply the second half of post-Thanksgiving shopping for bargains, Saturday has become a bit of a counterpoint. From American Express's Small Business Saturday to the American Booksellers Association Thank You for Shopping Indie to the Sherman Alexie driven Indies First campaign, these programs are trying to spotlight community-based independents. Is there financial incentive? Well, yes. If you register through the American Express program and spend $10 or more at a registered Small Business Saturday participant, you'll get a $10 credit on your statement. We also have a great lineup for our Indies First promotion. We'll have authors between 11 am and 5 pm (they are working in two-hour shifts, and I'm hoping to update the blog with exact times). You can of course buy one of their books, or also take recommendations. They are our honorary booksellers for the afternoon (and more than one of them actually spent time on a bookstore selling floor). If you're not in Milwaukee for the holiday weekend, it's likely that your favorite indie bookstore is hosting its own slate of author/booksellers. Michelle Huneven (a new novel is out in 2014!) is working at Vroman's in Pasadena, for example. Jess Walter? Why he's at Auntie's Bookstore in Spokane, while Sherman Alexie (the guy behind the whole idea) is spreading himself to five bookstores in the Seattle area. It's gotten to be a game to me. I want to know who's selling where and if I read their books or not? Prairie Lights has both Ethan Canin and Mary Helen Stefaniak. And if I hadn't found this USA Today article, I wouldn't have known that Wally Lamb is recommending Hannah Kent's Burial Rites at R.J. Julia. While you're thinking small and local, our friends at Local First Milwaukee are suggesting the Local First Challenge. Make a commitment to shift 10% of your shopping to local first stores, and consider shopping at the Buy Local Gift Fair on Sunday, December 8, from Noon-4 pm at Lakefront Brewery on Commerce. Can I Vet Every Book Recommended by Our Guest Author/Booksellers on Indies First/Shop Local/Small Business Saturday? No, But I Decide to Read Joan Silber's "Fools", Being it Is One of Only Two Titles Chosen By More than One Participant. I thought I’d skip posting a blog today, but it turned out that a book I just finished reading compelled me to write. It started back during the Books and Company 30th anniversary party, when I wanted to celebrate by buying a book. I wound up choosing Joan Silber’s Fools, her eighth released book. I had read one of her previous books, Ideas of Heaven, and liked the way the stories were distinct but still connected by both theme and linked details. It reminded me a bit of Joan Wickersham’s The News From Spain, which we had much success felling in hardcover. In “the best laid plans” department, the bought for book sat on my shelf, much the way I often hear customers talking about books they bought but hadn’t gotten around to reading yet. Every bookseller should have a pile of advance copies by their bedside waiting for completion, but I, perhaps to better empathize with our customers, also have a pile of purchased books, either from Boswell, or from visits to the many stores I visit around the country. Sometimes I read them right away, as was the case with Tasha Alexander’s Behind the Shattered Glass from BookPeople, and other times I have to make a slot for it, the way we chose The Absolutist for our in-store lit group, after seeing the book purchased from City Lit still sitting on my shelf after a good six months. Fools wound up being long-listed for the National Book Award, following in the footsteps of Ideas of Heaven, which was short-listed for that award. Earlier, Household Words won the Pen/Hemingway award. Silber's previous collection to this,The Size of the World was shortlisted for The Los Angeles Times Book Prize. * Fools is, however, is one of two books that was selected by two of our ten Indies First guest author/booksellers on Saturday. The other, by the way, was William Maxwell’s So Long, See You Tomorrow. Silber has interwoven stories make the connections look more like fate than coincidence. These are souls moving through the world, responding to folks like Dorothy Day, Sacco and Vanzetti, Gandhi. And yes, they are fools—for love, for money, for truth. I’ve never read Grace Paley, but after reading Ann Patchett’s essay about being Paley’s student made me think about this passion for conviction and truth that seems to drive the stories. And then I noticed that Silber teaches at Sarah Lawrence, so in a sense she's filling Paley's role at least in one way. And yes, she notes that she kept hearing “Everybody Plays the Fool” in her head while she was writing. So I feel like I had no choice. Now of course I was supposed to be working on our December email newsletter. What else would one do on Thanksgiving, after eating was done? But I still had four days until our talk about Louise Erdrich’s The Round House, and it’s sometimes hard to follow deadlines on Thanksgiving. I don’t usually advocate longer stories over shorter ones, but I have to say that the only story that didn’t work for me was “Better.” At only twenty pages, I had come to start expecting a novel in 40 pages (something I’d often said about the work of Alice Munro) and I felt like Marcus’s romance with Nico seemed more straightforward than other stories. On the other hand, I was quite taken by "The Hanging Fruit," the story of a ne’er do well son of a pair of hotel owners, who loses his money in France and after a bout of homelessness, works his way back to a simple life. And the woman who destroys him? She shows up several stories later, where he’s just a footnote. I guess I am a sucker for these story connections, and I love how all the stories play off a defining moment, of these anarchists living together in New York in the 1920s. Silber’s Ideas of Heaven had a similar sort of web, but it seemed connected in a different way, without a center. I’m not saying one is better than the other—just different. I will say that the defining incident had me thinking of Simon Van Booy’s The Illusion of Separateness. So finishing the book, I did think it was a good match for Joan Wickersham. We’ve now sold 40 copies of the book in hardcover and another 26 in paperback. Surely I could convince at least a couple more of those folks to pick up Silber. Or maybe I can leave that up to Valerie Laken and C.J. Hribal, who both have it on their recommendation list for Saturday. I’ll have everybody’s recommendation lists tomorrow. *What does it mean that Fools was not even reviewed by the Los Angeles Times, after shortlisting the previous title for their highest fiction honor? Is it a function of declining book page space, or perhaps a changing of the guard in editorial? I honestly don't know. In Conjunction with All the Indie Bookstore Promotions This Coming Saturday, a Little About the Newest Book from the More Prominent Indie Booksellers Around. As the Indies First*, Small Business Saturday, the Local First Milwaukee Shop Local Pledge, and Thank You For Shopping Indie promotions all gear up for this coming Saturday, I turned to the person whom our book editor calls “the patron saint of bookselling,” Ann Patchett. Her new book, This is the Story of a Happy Marriage collects work from Gourmet, Harper’s , Outside, Audible, Vogue, The Wall Street Journal, as well as book excerpts from State by State and her introduction for Best American Short Stories. It's true! I read a book not for an upcoming event or an event I wanted to book or for a book club that I was leading, but just to read. There is a double advantage to not having as many events booked in the holiday season. For one thing, the deadline for reading the winter books is a bit farther off, and I can sneak in some "selfish reading" time, as Hannah calls it. And for a second thing, when I work days with no errands, I can take the bus to work, giving me extra reading time. I've noticed that if you put the personal essays of an author together in a volume and you are very clever about it, you can label the book a memoir. Unlike calling collected short stories a novel, which publishers seem to have no qualms about (see most recently Marie NDiaye’s Three Women), this is not done as often as I'd expect. Calling something “essays” scares off a certain sort of reader, so the answer seems to be to not label the book at all. That’s what FSG did for Aleksandar Hemon’s The Book of My Lives earlier this year, and Harper has taken the same path. One of the interesting things about Patchett’s essay writing is that she notes that while the essays are factual, the novels are not. On the other hand, many fiction writers will say that only through fiction can they write the truth. Even stranger, I’ve had more than one journalist say at a talk that they feel that they can tell the truth through fiction but not through their journalism. I think it has something to do with not really being able to create the nuance and gray area necessary to get the story complete. But Patchett also argues against those writers who say that their books write themselves. I think the two sides are using slightly different definitions of "truth." I'm sure this has led to much dinner party discussion, as I've gotten the impression that Patchett is a spirited debater, and saw it first hand at a dinner in conjunction with her Milwaukee visit for The Magician's Assistant, when she engaged another spirited debater, the late David Schwartz, on several issues of the day. Author tours get their due in the essay, "My Life in Sales." Patchett’s essays in places like The Atlantic, The New York Times Magazine, and Granta certainly appear with some regularity. In addition, she’s also well known for memoir about her friendship with the poet Lucy Grealy in Truth and Beauty. But what you probably don’t know is that she started out as a traditional creative writing student, first at Sarah Lawrence, and then at the Iowa Writers Workshop, but left a teaching post with little notice, forcing her into Plan B, which was writing for Seventeen and Bridal Guide, with some waitressing thrown in. It has to do with making a number of changes in a game plan that was not working, including a first husband. Yes, Patchett can write about anything, but she has a special gift for capturing the people and animals in her life. I feel like I know Sister Nena**, the nun who taught her at St. Bernard’s, as much as I know anyone, and I’d probably argue that I met her dog Rose several times, even though we'd never met. Her father really came to life in her essay about trying out for the LAPD. And her husband Karl? There are a lot of good stories here; an amazing Paris dinner left the couple at odds, but an RV excursion (yes, both were probably magazine assignments) brought them back together from a breakup. And why did Patchett break her vow to not marry? That explanation is also in the connection. It’s been a good year for collected essays from some of my favorite novelists. Not only was there Aleksandar Hemon’s The Book of My Lives, but a spring highlight for me was Elinor Lipman’s I Can’t Complain. After reading these collections, I am much more apt to read essays from fiction writers I admire in the future. It’s an underrated pleasure. So what about the bookstore? Parnassus is given its due in “The Bookstore Strikes Back,” a piece that originally ran in The Atlantic, which was posted in just about every independent bookstore around the country. When that store opened, it was front page news in The New York Times, and led to an appearance on Stephen Colbert, which itself led to a run of signed copies. At least for now, we have a few signed copies of This is the Story of a Happy Marriage, but I’ll say up front that they are tipped-in pages, which is generally the case when we have signed books from an author that hasn’t visited. Some folks think they aren’t as good as the real signed first edition, but it’s a real signature and on a page bound in, not a bookplate. So Happy Indie First/Small Business Saturday/Thank You for Shopping Indie. We’ll see you at Boswell or Parnassus, or whichever indie bookstore you like to shop at. And if there’s no indie bookstore within 50 miles of your house, maybe there’s a town hall meeting in your future. *This links to a piece in the Los Angeles Times. **My fellow bookseller Jane is a big fan of this story, "The Mercies." After our visit with Anita Shreve for Stella Bain, and our book club discussion of John Boyne's The Absolutionist, I was chatting with Jane about the lasting effects of World War I and why it's seems to still resonate with writers enough that there are a steady stream of novels coming out that use The Great War as their jumping off point. For me, it was interesting that both novels I recently read had pacifists at the core, struggling not just with WWI, but with war itself. Interestingly enough, another major novel this fall reflects on these issues. The Cartographer of No Man's Land (Liveright), by P.S. Duffy, was one of the picks at the editors' buzz panel at Book Expo America. It was also one of the featured titles on the "Indies Introduce" program, and well might have been the panels fiction pick. The family is from Nova Scotia, and the story follows Angus McGrath, who has enlisted, defying his pacifist father (connection one) and is on the search for his missing brother-in-law Ebbin. That quest to find the missing person is also at the heart of Boyne and Shreve's novels. McGrath finds himself on the front lines, facing the new chemical weapons, and dealing with devastating losses, while the family he left behind is caught in their own drama, when McGrath's son Simon is involved in a controversy defending the town's German schoolteacher. I was just talking to a visitor about how Milwaukee erased a lot of its ethnic German-ness in World War I (like teaching kids in German in the schools), for fear of similar reprisals. Fellow Canada-phile (Corrected! Ms. Duffy is a Minnesotan who still knows a good Canadian story when she hears one) Frances Itani praises P.S. Duffy's The Cartographer of No Man's Land in The Washington Post. "Turning the final page, I wanted to go back to the beginning, if only to contemplate a writer who has such a broad and compassionate understanding of the human condition," she writes. I just had this conversation about women using initials to not be put into the box of woman writer. 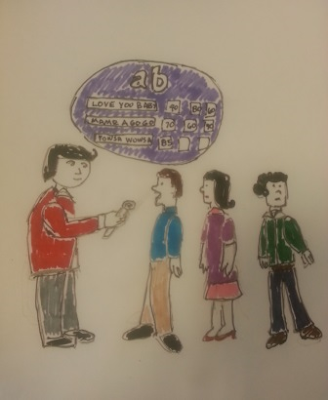 Another publicist was surprised to hear that a local radio producer who uses initials was a man, as publishing folk are so used to that generalization. It turns out that outside of writing, plenty of men are known by their initials. I've talked a bit about Me Before You, but it turns out that JoJo Moyes' follow up novel, The Girl You Left Behind, definitely fits in my Great War roundup. Moyes covers two love stories set almost a century apart, united by a painting titled, of course, "The Girl You Left Behind." In the historical plotline, German soldiers commandeer a hotel for their meals, and the Kommandant takes a liking to the painting. Sophie Lefevre tries to use this to help get her husband out of a prison camp, but of course their is a price. And in the contemporary storyline, the recently widowed Liv, for whom the painting is a prized possession, is confronted by the owner's descendants, who claim the painting was stolen during the war and is not rightfully hers. Elisabeth Egan wrote in the Los Angeles Times: "Minor quibbles aside, The Girl You Left Behind is, well, impossible to leave behind. Even the most hard-hearted reader will want to know what happens to these women, not just the flesh-and-blood ones but also the bewitching one on the wall. Where will the painting land, and was its subject a casualty of war? In this moving paean to daring, determination and perspicacity, Moyes keeps the reader guessing down to the last hankie." Another book I left behind this fall (hey, there are a lot of noteworthy books out there) is Thomas Kenneally's The Daughters of Mars (Atria), which looks at World War I from an an Australian's perspective. Once again, there's a tie in to Stella Bain, as this novel is told from the perspective of two nurses serving the troops on the western front. The carnage is horrifying, but the plot is also driven by a conspiracy between the two, as well as two love stories. As Kirkus Reviews notes, this is a war story first and foremost, so it cannot end well. That said, the reviewer offers that "Keneally is a master of character development and period detail, and there are no false notes there." The historical context for The Daughers of Mars is Gallipoli, the battle where Australians felt they were used as pawns in an attack gone bad by the British and French on this outpost of the Ottoman Empire. Per Alan Riding in The New York Times Book Review, Gallipoli attack is still a day of remembrance down under. Riding reviews the book positively, but it's not a review filled with quotable sentences, so just read it and judge for yourself. I was poking around for classic but perhaps now forgotten war stories and came upon this recently re-issued novel from Serpent's Tail called Her Privates We, by Frederic Manning. At the time, Ernest Hemingway called it "The finest and noblest book of men and war that I have ever read" while T.E. "Lawrence of Arabia" Lawrence" noted that "I am sure it is the book of books so far as the British Army is concerned." The novel was originally published privately in 1929 as The Middle Parts of Fortune under the pseudonym Private 19022. The publisher notes that Her Privates We is the novel of the Battle of the Somme told from the perspective of Bourne, an ordinary private. A raw and shockingly honest portrait of men engaged in war, the original edition was subject to prunings and excisions because the bluntness of language was thought to make the book unfit for public distribution. This edition restores them. It is being championed by William Boyd, who calls it "a unique and extraordinary novel." In this review in The Independent, David Evans explains the book's title and gives more on the book's background. He calls it "an imperishable modernist masterpiece", which is recommendation enough for me. What's Going on This Week at Boswell--The Grinch Visits on Tuesday, Plus Small Business Saturday/Indies First Author Visits. Grinch-mas is a new holiday tradition inspired by Dr. Seuss’s classic How the Grinch Stole Christmas! that encourages readers to “grow your heart three sizes” through the celebration of family reading, giving from the heart and community spirit. National Grinch Day, on December 1, will kick start the 25 Days of Grinch-mas. 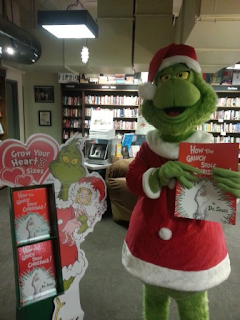 We will be kicking off the Grow Your Heart 3 Sizes Grinch-mas campaign on Tuesday, and we've invited the Grinch himself. We'll of course have activities, and you and/or your kids can take a picture with the Grinch himself. How's that for a holiday card image? There are a few other components that go along with "Grow Your Heart Three Sizes," which officially kicks off on December 1. Each participant (mostly kids) gets a bingo sheet that encourages them to do good deeds in their community (donate toys, clean your room, make a card for your teacher, etc). Once they have completed a row they can bring it back to the store and receive a button that says "I grew my heart 3 sizes". They also receive a postcard where they can write down three good deeds they completed. We then send these postcards back to Random House and the company will make a donation to a literacy organization. We will also have a counter easel in the childrens department counting down the days to Grinch-mas. Saturday, November 30, 11 am to 5 pm, at Boswell: Indies First and Small Business Saturday. For Indies First, we'll have ten (or maybe eleven, we're still not quite positive) authors at Boswell. They are fellow booksellers for the day, with a list of their own favorites to share. You can also, of course, buy a copy of their latest book to be signed. Sharon's been helping put this together, and we'll have a full post dedicated to it on Wednesday. And here's the American Express component. We've registered as a designated Small Business Saturday participant. That means if you have an AmEx card and register by November 30, you can get $10 back on your statement if you spend $10 or more with Boswell, or any of the other Milwaukee area participants. You only get the credit once, and you must spend the full $10. Sunday Bestseller Post--Women Rule Hardcover Fiction, Politics Then and Now, Three Hot Hanukkah Gifts, Which Books are Connecting at Our Presentations, Plus the "Journal Sentinel" Book Reviews. Women sweep the top five for the second week in a row, and look at that, Little, Brown has a near sweep, with only Amy Tan sneaking from Ecco. I realized that as I've been doing my book talks, most recently at the Shorewood Public Library on Saturday, that my recommendations from male writers are also a bit thin. I need some gender diversity here. I'm hoping the James McBride, with his National Book Award win for The Good Lord Bird, will break up the girls club next week.Here's a link in The Huffington Post to Donna Tartt's interview on the CBS Morning News. Hardcover nonfiction is where the action is during the holiday season, at least with the adult titles. Alisa Solomon and Ari Shavit are definitely the Hanukkah gifts of choice, while locals like Governor Scott Walker, whose Unintimidated: A Governor's Story and a Nation's Challenge came out Tuesday, Sanford D'Amato, Donald Driver (the Milwaukee partial claims on the Packers go back to the days when they played several games a year at County Stadium), and the Pfister Hotel book all turn local heads. Here's Scott Walker in the Wisconsin State Journal talking about whether this is a campaign book. He says no, but he's also become head of the Republican Governors Association, another clue to his aspirations. For those of you still deciding whether to tackle Doris Kearns Goodwin's The Bully Pulpit, here's a link to Frank Davies' positive review in the Miami Herald,while in The Washington Post, Heather Cox Richardson notes that journalists, not presidents, hold the key to reform, just like they did in the day of Roosevelt and Taft. It's almost time for me to read The Round House for our in-store lit group meeting on Monday, December 2, 7 pm. As last year's National Book Award winner, I should be able to gather a lot of source material, like this interview in The New York Times with John Williams. Four ex-eventers dominate the top five--could this mean that Allie Brosh is in our future? Not to my knowledge, but I guess we can dream. We sold out of Mr. Gendelman's book at Nina Edelman's talk, but we have stock back for folks who are still looking for a Hanukkah gift. Or Christmas too--we had a broad audience of folks, with a lot of folks interested in World War II. In a way, the story of A Tale of Two Soldiers is a real life version of Simon Van Booy's The Illusion of Separateness. I had to expand our top five here because two events dominated the top five, edging out very substantial sales from non-event titles. We just heard from J. Hamilton Ray, thanking us for inclusion in the blog and Woman's Club book talk. I just picked up the cue from Jane. Now we even have a brush squirrel ornament display, featuring not only Squirrels on Skis, but also Flora and Ulysses. I thought foxes would be hot (and they are, on the pop music charts), but this seems to be quite the popularity battle between woodland creatures. I will say that I sold 4 copies of The Day the Crayons Quit at my Shrorewood Public Library talk yesterday, definitely the big hit of the morning. I only brought two, so another attendee headed to the store to buy two more. So what's being reviewed in the Journal Sentinel today? Jim Higgins immerses himself in Respect Yourself: Stax Records and the Soul Explosion. He notes how Robert Gordon "chronicles the growth of Stax (and later its sister label, Volt) from a modest garage studio in 1957 to a hit-making Southern counterpart to Motown — and through its decline and bankruptcy in 1975." Well hullaballoo! Here is Joan Frank on Ann Patchett's This is the Story of a Happy Marriage is available on the Journal Sentinel website. Frank offers an opinion on why Patchett is so beloved: "Patchett's is a no-nonsense voice: clear, sane, companionable. Readers trust her, and these essays (though some feel slight) won't disappoint her fans." And Nisi Shaw's review of Nicola Griffith's Hild also appears in the Journal Sentinel today. It's a historical, based on the life of a real medieval saint. Shawl writes "It's the book's sheer beauty that will most astonish readers...Griffith's telling of Hild's adventures offers us something far better than mere comfort: the lure of the sublime." Saturday Gift Post (Yes, Posted Late)--On Holiday Boxed Cards. Our holiday cards are selling well and we're beginning to run out of certain designs. 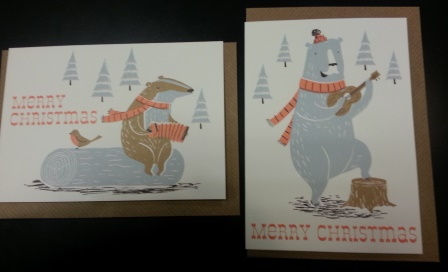 This weekend folks have been calling looking for particular cards, sent to us from websites. The problem is that just because we carry a line doesn't mean we carry everything from a line. If nothing else, that would be boring. What I'm showing is still just a small assortment of our boxed cards. 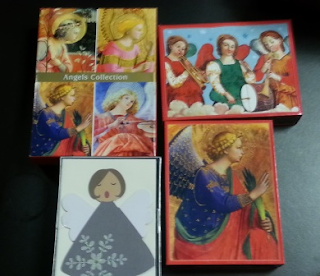 The trick is to make sure you represent all the icons of the holiday, from traditional Christmas icons like angels and the manger, as well as less religious but still Christmas images such as Santa Claus and trees and cardinals and holly. 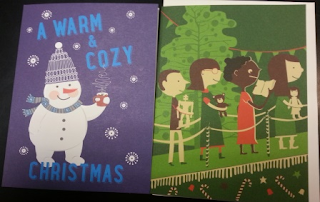 And then there are images for folks who want a general holiday card, with snow scenes, doves, penguins, and woodland creatures. I think the dove can go either way--a lot of our customers like the peace connection. One of course has the tendency to move towards your own interests. 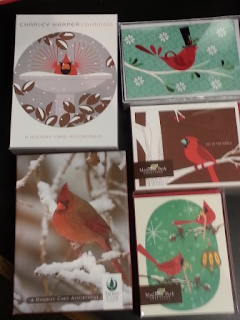 We quickly determined that without any sort of structure, I am going to buy a lot of bird designs. I also needed at least one season in the field to figure out that we had a good market for more religious designs. Another thing I found is that there is a market for crazy cards, but you're more likely to sell them loose than boxed. I still like to have a small assortment of unusual designs. I hoped our science fiction Santa (see above--it's a multi-armed Santa seemingly replaced by a robot model) would have a certain appeal with our customers gravitating towards science fiction and graphic novels, for example. And then there are some cards that seem not of the moment; it wasn't until I received the design that I realized that Santa reading a printed map seemed both out of date for the joke and yet not retro enough to be nostalgic. Trends come and go. When I bought our first collection in 2009, I liked these laser-etched cards from Galison, but they didn't really work as well as I'd hoped. Several years later, Peter Pauper came out with a line at a cheaper price point that worked better. If you look carefully, you'll probably notice that some of our designs stay the same from year to year while others switch out. Just like books, our reorders are based on sales. My rule of thumb on holiday cards is that I will bring a design back in if we sell out sometime before December 15. What that means is that if you come in on December 26 and buy up a design you really like at markdown, we're not going to have it the next holiday, unless of course it still didn't sell through at markdown (in which case the pre-holiday price still starts at 25% off in most cases). 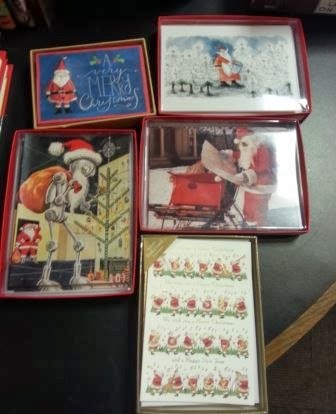 There are some holiday items that we specifically buy for multi-year sales, but I'll leave that boring case-pack minimum conversation for another blog, if at all. This coming Wednesday evening is Hanukkah, and while we have a good sale in books, and wrap a lot of presents, and can even sell a novelty item if I find something great (like this year's Hanukkah ducks), the card business is slower. Part of the problem is that the cards are pretty boring. 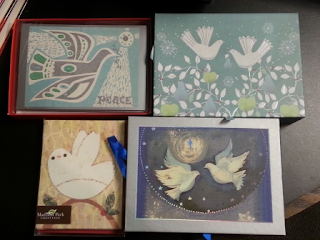 More observant Jews send High Holiday cards, and many get them at their synagogue shop. 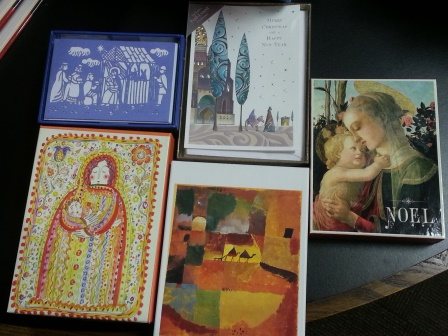 What we find is that a good percentage of the cards are sent by non-Jews to Jews, but if the card doesn't pop, you can substitute a winter scene and wish them a happy holiday. That works better when the holidays are close together. This year you can send a Thanksgiving card, and yes, we have a few of those left too. 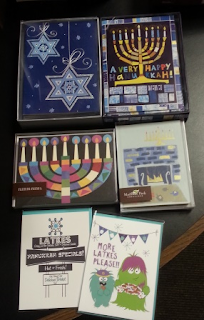 The loose Hanukkah cards tend to be more clever, and also sell better. We're actually almost out, but we've got a few latke-themed ones. So should I do a blog post on holiday wrap? We'll see if I can say anything interesting about that. i'll Give it an 85. It's Got a Good Beat and You Can Dance To It--The Rock and Roll Roundup. This is not the best way to put together a display, but one takes where one finds it. In this case, inspiration was in overstock, where I saw several multiple copy piles of music books, and I thought, what's the point of having books only in overstock and not on display? Since our "we saw heaven" display was completed with the appearance of Eben Alexander it seemed time for a pop music display. I don't generally like doing displays from one section, so I wish I had been able to pull something history or photography or fiction, but this round table (I will not tell you its origins) doesn't fit that many books. To get in the mood, I watched some old video clips of American Bandstand. There's nothing like gals and guys rocking out to Herb Alpert and the Tijuana Brass's cover of "Mame" to get you in the mood. That's the source of this "Rate a Record" illustration. Beatles Vs. Stones (Simon and Schuster), by John McMillan, upends the traditional myth of the Beatles as the clean-cut kids and the Stones as bad boys. From the publisher: "McMillian reveals how the Beatles-Stones rivalry was created by music managers intent on engineering a moneymaking empire. He describes how the Beatles were marketed as cute and amiable, when in fact they came from hardscrabble backgrounds in Liverpool. By contrast, the Stones were cast as an edgy, dangerous group, even though they mostly hailed from the chic London suburbs." Here's a little more from Slate Magazine. While every rock star of the 1960s and 1970s has had a contract thrown at them, high-profile biographies continue to get a big push, though in my opinion, they rarely do as well. Being that the memoirs are "as told to," isn't it just a detail of merchandising in the difference between a positive biography and an as-told-to memoir? Robert Plant: A Life (It Books) is out from Paul Rees, which chronicles his life from boyhood through solo career. The publisher notes that his current output is "some of the most acclaimed work of his career." I guess I don't keep up as well as I should. Here's Scott Porch in Salon on big bios. Also featured in Porch's roundup is a new Johnny Cash bio from Los Angeles Times music critic Robert Hilburn called Johnny Cash: The Life (Little, Brown, as opposed to "a" life). It has the exciting tie-in of a commemorative postage stamp. Hey, I bought a sheet of 'em, so it must work for something. There are a lot of great reviews out there for this one. David Cantwell in Slate (apparently my go-to media organ for rock bios) observes: "Hilburn's work is far and away the most insightful, entertaining, comprehensive, and well-told Cash biography to date." Steely Dan's Donald Fagen has a memoir called Eminent Hipsters (Viking) that starts with growing up in the New Jersey suburbs, and looking to such inspirations as WOR DJ Jean Shepherd and no less than Henry Mancini and his "swank, noirish soundtracks." He met up with Walter Becker at Bard College, where their blend of rock, jazz, poetry, and swank noirishness led to a legendary career. Why do I remember that the album Aja debuted at #26 on Billboard and then moved to 3? Memories are a strange thing. In The Wall Street Journal, David Shifflet reviews not just Donald Fagen's memoir, but also Graham Nash's Wild Times and Ray Davies' Americana. Just to get us into this century, I should also mention Cee Lo Green's Everybody's Brother (Grand Central), written with Big Gipp and David Wild. As not quite the elder statesman of some of these other subjects, I haven't really found traditional print/online reviews on Everybody's Brother, but Publishers Weekly wrote: "Brassy, often snarky, and totally madcap, Cee Lo mouths off in this ribald tell-all, to the enjoyment of his fans and newbies everywhere." If you think there is too much testosterone in this blog post, feel free to read about Linda Ronstadt's Simple Dreams memoir.